Those are the words of Nebraska offensive line coach Mike Cavanaugh. In a year where the Huskers will have new starters at quarterback, running back, wide receiver and tight end, the offensive line is the one position group that returns mostly intact. Cavanaugh said he thinks his group is ready to shoulder that responsibility. Cavanaugh hasn’t been one to rotate players along the line unless they were too injured to play, and as a result left tackle Nick Gates, left guard Jerald Foster, swing lineman Cole Conrad, right guard Tanner Farmer and right tackle David Knevel have all seen significant playing time together. All five of the projected starters are upperclassmen now, and according to Foster, they’ve all gained trust in each other. The one position on the line that doesn’t have a returning starter is center with the graduation of Dylan Utter, and Conrad, who split time with Knevel at right tackle last year, is battling it out with redshirt sophomore Michael Decker. Whoever emerges is going to play a vital role for the offense. Conrad is getting the first crack at the first-string reps, but the coaches are giving Decker a chance to prove what he’s capable of as well after working behind Utter last season. Conrad has only worked primarily at center for less than a full offseason, but Foster is already comfortable playing next to him. Foster has been in the program for quite some time, but despite his talent has less game experience on offense than most of the others because of a knee injury that cost him all but three games in 2016. Coach Mike Riley initially ruled Foster out for the season, but after using a redshirt his freshman year despite being healthy, getting a year of eligibility back was not an option and so Foster rehabbed hard and got cleared to start the last three games of the season, his first three starts as a Husker. With a few games and a full offseason under his belt, Foster seems poised for the kind of season many expected him to have in 2016 so long as he can stay healthy. Gates, Foster, Conrad, Farmer, Knevel. 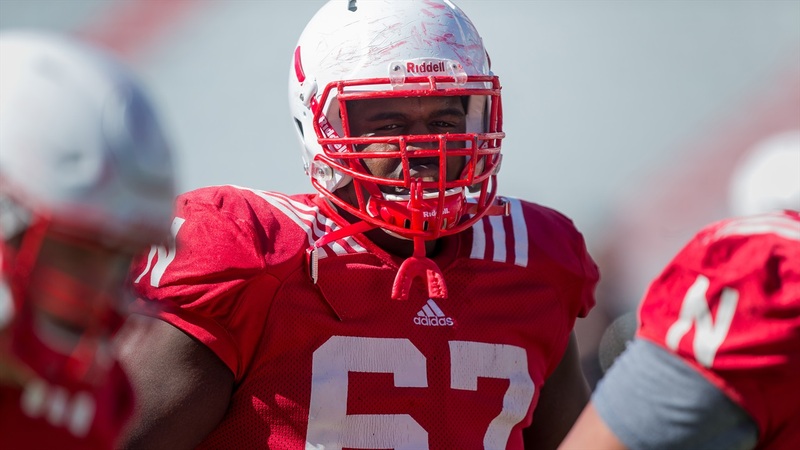 With the rest of the team going through a transition period, the offensive line has to be a rock for Nebraska, and Cavanaugh said he has faith that his unit is up for the task.